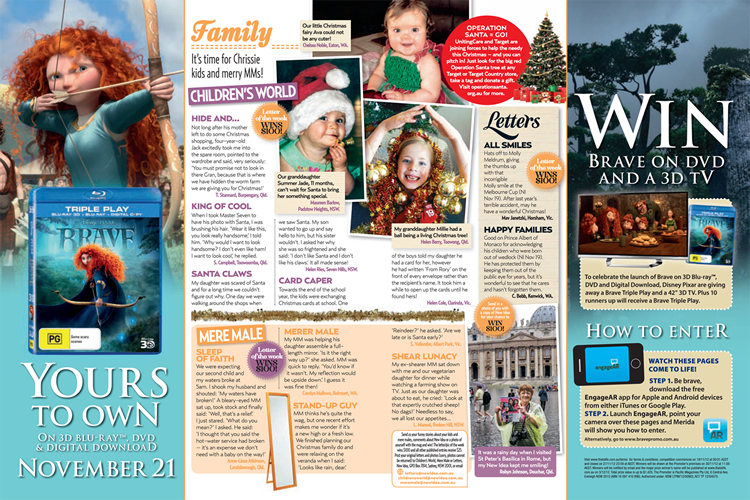 We were tasked by Pacific Publications to bring Disney’s Brave Blu Ray & DVD release print campaign to life. The campaign was based around a competition, we came up with the idea for users to use their phones to scan the double page spread in New Idea and That’s Life magazines. Once scanned, we designed an animation of the main character, Merida, which came to life and took over the user’s phone screen. Once ended, the animation, Merida pulls out an “Enter Now” button. The user clicked and it took them to the landing page we designed, so they could enter the competition. We also built a bespoke database and drawing mechanism for the competition. The campaign received over 10,000 entries over a two week period.